Does believe mean hold as true without proof? "Belief means not wanting to know what is true." Atheistic writers can sometimes be quite persistent in their claim that the Bible is anti-reason and anti-proof. This claim is untrue, but does not come as a surprise. People who aren't devoting a part of their life to studing the Bible should hardly be expected to know what it says. Doesn't "believe" mean hold as true without proof or logic? "Belief is when someone else does the thinking." Non-Christian literature generally interprets a Christian's use of "believe" as "hold to be true without proof or logical reasoning". Some professing Christians may indeed use the word in just this manner, but holding to unevidenced faith is not a biblical position. God has not furnished prophecy, evidences, miracles, resurrection, the apostle's testimonies, the believer's own testimony, and Scripture itself all so that his people can walk around and say they believe in him for no good reason. Christians should state what they believe in the context of why they believe it; especially when addressing those who doubt the existence of God or the believability of the Bible. 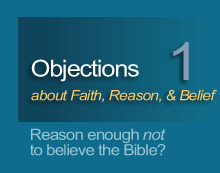 The Christian faith has excellent empirical evidences and logical arguments. A Christian failing to share those things only cheats the sincere nonbeliever out of the proof for which he or she professes to be waiting. Meanwhile, until nonbelievers are shown those evidences, they should refrain from jumping to the conclusion that there are none. Aren't people punished for using reason or questioning the faith? Christians: biased, bigoted, intolerant, and judgmental?